Great fun for the young and young at heart. How good it is to know that there are still companies that value the memories of kids. You remember those days when you sped down the sidewalk on your tricycle, pedal car, or Big Wheels, don’t you? Now such memories can be engraved afresh into the minds and hearts of small children through pedal toys. 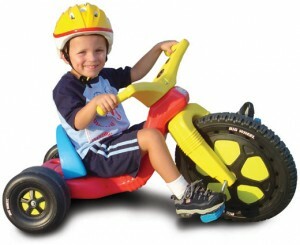 These vehicles for two to four year olds and older come in a variety of shapes and styles. But they all produce similar thrills, the joy of controlling and propelling his or her own vehicle down the sidewalk, maybe the same sidewalk or driveway you traversed so long ago. Each has a working steering wheel, pedals that move them forward or backward, and an adjustable seat so they can continue to enjoy it as they grow. Big wheels have been classic fun for years! Ever since the original big wheel came out, kids young and old have enjoyed pedaling around in them. Their design has not changed much over the years either – showing just how well designed it was to maximize the enjoyment of the rider. Pedal toys come as cars, tractors, planes, or fire trucks. Some are designed with boys in mind (like the fire truck) while others appeal more to the girls (like the pink plane). Those with chain drive have an enclosed chain so that clothes or skin will not get pinched in it. Others, like the fire trucks, are propelled by means of levers, and pedals do not go around but in and out like the old steam locomotive. In addition to the variety of pedal cars, Peg Perego also offers a battery-operated tractor for two to four year olds for under a hundred dollars! It runs on a six-volt rechargeable battery and moves at a safe 2 ¼ miles per hour. Each vehicle is designed with safety in mind. The wide wheelbase and low center of gravity make them difficult to tip over. The small pedal crank length means it will be difficult to get any of the pedal cars to go too fast. The cars, planes, and trucks are also designed to last. The companies know how rough children can be on toys. Some of the models, like the fire trucks, are made of heavy gauge steel, the same type of steel used in making pedal cars decades ago. These are generally more expensive and last longer. Others, like the tractors, are made of heavy duty plastic. All have large wheels but the fire trucks have chrome and hard rubber wheels. Generally, if you want something that will last through several children, plan to spend more initially. Now imagine the joy written on the face of your toddler when he or she receives one of these big wheels as a birthday or Christmas present. But it will be a learning tool as well, for it will teach eye-hand-foot coordination as well as the importance of sharing with other envious siblings or neighbors.